The iPhone gained a handy feature that is now standard in iOS which allows you to quickly respond to an incoming phone call with a preset text message. This is a perfect solution if you’re busy in a meeting, classroom, driving, or in any other situation where you can’t take a phone call, but the caller is important enough to let them know they’ll be contacted as soon as possible. You can have up to three preconfigured messages. You can go with the preconfigured Apple choices, or better yet, customize and make your own that correspond to your communication style. Choosing three general responses is fine, but for those who share an iPhone with personal and work, a helpful option is to have a separate choice for those incoming work and/or personal calls that you may not be able to answer at the moment. Be as specific or as vague as what works for you, but something like “Busy, will call back soon” is fine. This is a much better solution than just sending callers to voicemail, ignoring calls, or muting them as they come in. The appearance of the auto-replies feature looks slightly different in the newest versions of iOS, but the functionality remains entirely the same throughout iOS 6 and iOS 7, both in setting and using the automated canned responses. The only requirement is that you have an iPhone, of course. I tried this on my iPhone 5, but it does nothing. Interesting, but not quite the solution I’m looking for. All smart phones have an Airplane mode … So why isn’t there a driver mode? In driver mode, the phone can still use apps, such as music, Bluetooth and GPS, but should any communications, such as call, txt, email, social media…they would all get an auto reply that states, can’t talk I’m driving…then the message would be delivered when the user turns off the driver mode. 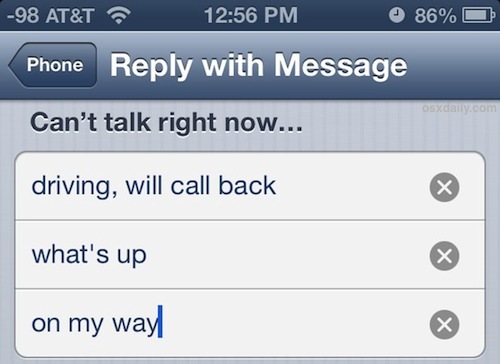 This should be a standard feature on all smart phones. Sorry I can’t take your call right now but if you leave me a message, I will get back to you as soon as possible. Thanks and have a blessed day!!! I need instructions to change default phone reply messages for a iPhone 7 plus, please. I agree with James. iPhones (all phones) need a driving now can’t talk button. Same for texts. Driving can not talk will call you back. Call you back in a few minutes. I m agreed with the James driving mode should be introduced in the cellphone so that there should be a restriction on phone and text.